inscription: Left edge has "Tea Lautrec Litho- S.F" printed in black. 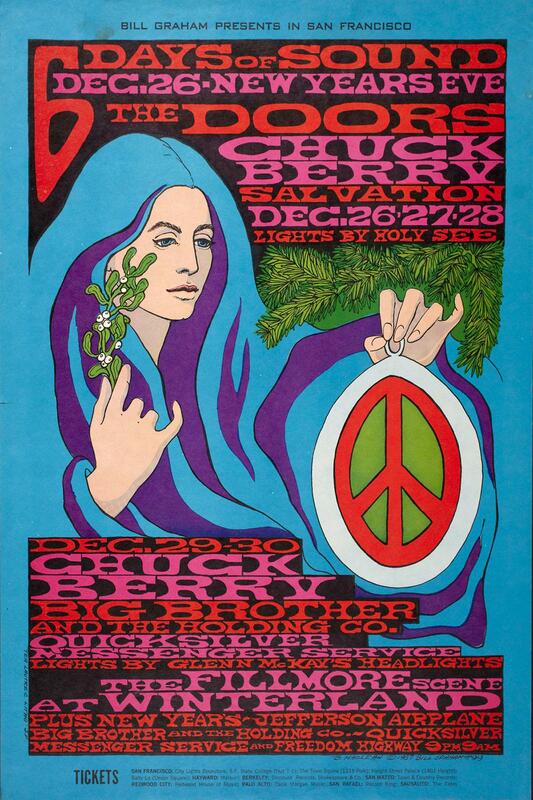 Bottom right corner has "B. Maclean (c) 1967 Bill Graham #88." Poster has a turquoise background with a drawing of a woman with long purple and turquoise hair in the center. The woman is holding mistletoe and a peace symbol ornament under pine branches. The poster has pink and red text. It reads, "6 Days of Sound/ Dec. 26 - New Years Eve/ The Doors/ Chuck Berry/ Salvation/ Dec. 26-27-28/ Lights by Holy See/ Dec. 29-30/ Chuck Berry/ Big Brother and the Holding Co./ Quicksilver Messenger Service/ Lights by Glenn McKay's Headlights/ the Fillmore scene/ At Winterland/ Plus New Year's - Jefferson Airplane/ Big Brother and the Holding Co. - Quicksilver/ Messenger Service and Freedom Highway 9PM-9AM." Bottom edge has ticket information printed in black.